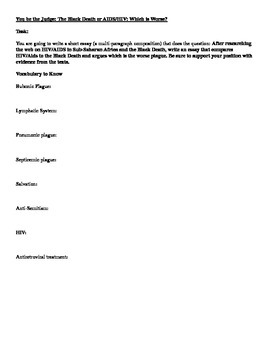 Students will conduct research on the Black Death and Aids to write an argumentative, five-paragraph essay on which of the two epidemics is the "worse epidemic." Provides the scaffolding for students to be successful, including vocabulary word list to review before beginning the assignment, graphic organizers to list their research, and a brainstorming/compare contrast graphic organizer to complete before beginning the prompt. Links to several websites are listed. 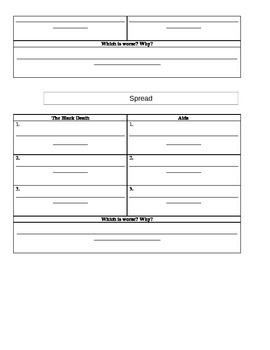 The rubric is not attached--however the argumentative essay rubric provided by the Literacy Design Collaborative works well with this writing prompt.